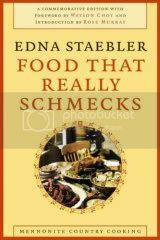 Before Edna Staebler died last September, she told me Wilfrid Laurier University Press will re-issue her first cookbook, Food That Really Schmecks. The cookbook, a favourite in many kitchens across Canada and beyond, was first published in 1968 and provided readers and cooks alike a glimpse into Waterloo County Mennonite life. Thanks to the wonderful people at the Press, I secured some copies to distribute to a few bloggers for A Day That Really Schmecks, a foodblogging event that celebrates Edna and, as she put it, “irresistibly good-schmecking (tasting) food.” I’ll be posting a round up on 15 January, on what would have been her 101st birthday. My review for Canada Eats will be posted shortly. Selecting a recipe to write about was at once difficult and easy: difficult, because this 334-page book is filled with mouth-watering recipes for simple and hearty foods that run the gamut from Apfelstruedel to Zucchini; easy, because of one point in time, when our dear Edna was caught in something called The Cookie War. From the late 1970s to early 1980s North American corporate cookiedom was obsessed with manufacturing cookies that were both soft and crispy. Proctor and Gamble “patented” a recipe in the USA in 1979 (1984 in Canada). When Nabisco began baking similar cookies, P&G sued for infringement of copyright. You see, they were both using Edna’s Rigglevake Kucha recipe that was published in Schmecks. Rigglevake is a Pennsylvania Dutch word meaning “railway.” No one knows how these dark and light pinwheel cookies were named railway cookies. 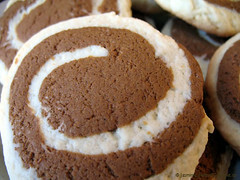 It could be because the biscuit’s spiral is reminiscent of a steam locomotive’s wheels as they ride the tracks. 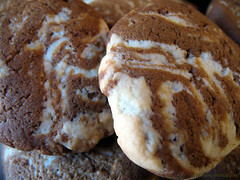 The cookies are at once crisp (from the white swirl) and soft (from the molassesy dark swirl). In 1983 one of Nabisco’s lawyers called Edna about the rigglevake recipe (the call wasn’t returned—E was busy and forgot). The following year, a lawyer for Proctor and Gamble visited her about the recipe. Edna talked to Bryan Dare, (of Dare Cookies) about this. He explained that a published recipe could not be patented…Nabisco tried to prove the recipe Edna published (one received from her Mennonite friends), were crisp and chewy while Proctor and Gamble argued her recipe wasn’t the recipe they were using. Edna was invited to Delaware and to New York. One lawyer suggested that if Edna were to go, the lawyer would go up to Sunfish Lake to take care of Edna’s cats. She declined both offers. And why not? Not only was Edna in NYC 30 years previous and really didn’t think it held a candle to either London or Paris, but her darling kitties would not be in the care of some lawyer from New York: “Imagine a lawyer looking after my cats!... [the same lawyer who] left cookies in the oven for half an hour!”—yes, one of the New York lawyers, who’d never baked before, decided to make rigglevakes and produced singed discs. 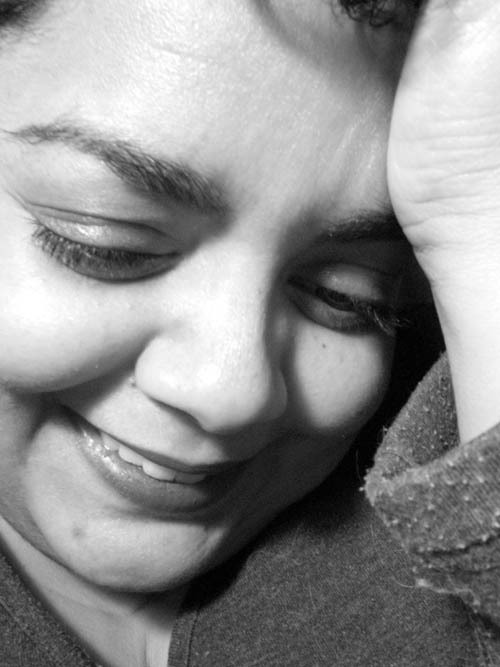 The story was picked up by Canadian Press, the local newspaper and CBC Radio’s Morningside. Edna received calls from radio stations across Canada and the US. Reporters from Harpers, Forbes and The Wall Street Journal interviewed her. CBC-TV’s The Fifth Estate produced a segment about the issue, contrasting the goals of big business against the idyll of Edna’s life. She even received, and declined, an invitation to appear on The Jay Leno Show—much to the befuddlement of the show’s producers. Edna, being Edna, didn’t care who won or lost the legal wranglings and got on well with both sides. All this was nonsense to her and her friends. The entire episode finally came to an end in 1989, when Edna decided to support Nabisco, and the dispute was settled out of court. From Food That Really Schmecks by Edna Staebler, originally published in 1968 (p193), reissued by Wilfrid Laurier Press in 2006 (p215); reproduced with permission from Wilfrid Laurier University Press. Mix the light and dark parts in separate bowls. Blend the sugar and butter for both parts. For the light part beat in the egg then alternately add the milk vanilla and baking powder sifted with flour. For the dark part add to the butter-sugar mixture the molasses, water and vanilla alternately with soda and enough flour. Break off pieces of dough from both dark and light parts, shape them into rounds and roll hem separately about 1/8 inch (3mm) thick. Put on top of the other and roll up like a jelly roll and slice off pieces as thinly as you can. Place on greased cookie sheets and bake at 350 degrees (F) (170C) till done. The amount of flour you need will depend upon your kitchen’s mood. I did try and weigh out how much flour I wound up using but, well… I recommend starting with 280g (2 cups) of flour sifted with the bicarb or powder (as requisite) and then add more as you need it. What you want is a dough that doesn’t stick and rolls out well, as if you were doing cut-out cookies. Baking time depends upon how thickly you slice the rounds, with (of course) thicker rounds taking longer to cook than thinner rounds. Check after 15 minutes—you want the bottoms to be tinged to a golden hue. This is a perfect “no-waste” cookie dough: press together scraps of the light and dark doughs, roll to about 7-8 cm and slice—you’ll get a lovely marbled biscuit…mind you , if you don’t feel like making the jelly roll, you can do this instead. These biscuits expand, so it is wise to keep them small/well spaced. * Summarized from Veronica Ross’ To Experience Wonder: Edna Staebler, A Life, and conversations I had with Edna last year. ** A point to those of you who can figure out what’s wrong/hilariously funny about this. ***Another point to those of you who can figure out what’s wrong/hilariously funny about this. ****I always giggle when I hear of city slickers going off to the Hinterland to find enlightenment…I guess I’m just lucky that I know life can be happy and peaceful outside of skyscrapers, traffic jams and frozen dinners. Wow what a great story...look like great cookies. Wonder why she went with Nabisco. Why do I have the idea that picture is close to home. I think I'd have really liked Edna. I'm guessing that your joke about the Cuisinart food processors is that many Old Order Mennonites didn't/don't have electricity in their homes. According to Edna's Cookie War chapter/article, though, the ladies who were helping her at the time luckily did have electricity and thought that the Cuisinarts might come in handy. Ellie -- so glad to see you again. That's one of my favourite Edna pictures...I think it captures her sense of fun. Tanna -- I think you really would have liked her. I was trying to find your email address to get you involved, but I couldn't find it :( No matter, there's a follow-up event which I hope you'll cook for. Mama Squirrel -- a point for you. OOM usually don't have power--I know from E they didn't have phones. Melissa -- You are so wonderful! Welcome and thank you! Hi Jasmine, I made some of these today (for Easter) and thought of you and the Day that Really Schemecked. Nobody ever answered your second "what's wrong with this" note, so I will: Old Order Mennonites would have been reluctant to become involved with a court case, particularly if it involved taking an oath. 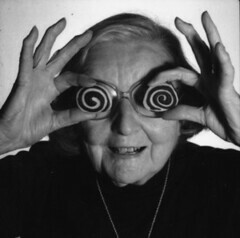 Love the photo of Edna with the Rigglevake cookie "eyes," although I never had the opportunity to meet Edna, she was my culinary and writer heroine. I have every one of her "Schmecks" cookbooks and have collected some of her other Canadiana work. These rigglevake cookies are amazing. I grew up in an rural area of Markham where we had many Mennonite families who were a little more progressive but the old recipes remain the same. Thanks for posting this wonderful recipe...from another Edna Staebler fan!